No butane. No alcohol. No glycol. No glycerin. No fillers. No added terpenes. 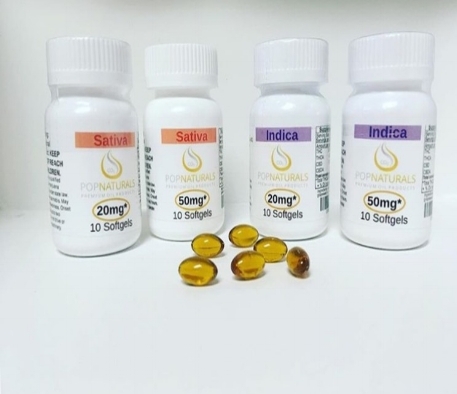 POP Naturals Premium Oil Products are made with pure, unaltered CO2 oil and can be ingested, vaped, dabbed, applied topically, used in baking, or taken orally through sublingual or buccal administration. Because there is more to medicine than just THC or CBD potency, all of our products are lab-tested and labeled with results for microbiological, pesticide, & residual solvent screening, full cannabinoid profiling and terpene analysis, so you can know more about your medicine™. Available in .5 g and 1 g child-resistant, easy to use dispensing sticks. Oil is strain-specific sativa, indica, hybrid, HIGH CBD, or SUPER CBD™. Pyrex, dual-coil vape cartridge with color-coded silicone seals and 510 threads. Pre-filled with 500 mg strain-specific sativa, indica, hybrid, HIGH CBD, or SUPER CBD™ oil. Push-button battery is 4.2 volts with 510 threads, usb charger, and storage case. CBD, indica, or sativa oil blended with grapeseed oil & encapsulated in gelatin. CBD available in 10 packs or 30 packs of 20 mg. Indica and sativa available in 10 packs of 20 mg or 50 mg. Copyright © 2015 POP Naturals. All Rights Reserved.